Correct. I’ve seen its famous lighthouse from St Ives and Gwithian but can’t ever remember going on the beach or walking out to the point. Maybe I was taken there as a child but it seems unlikely. So, there it is. Godrevy is a famous Cornish landmark but I don’t think I’d ever seen it up close before going there with my eldest daughter and our dogs earlier this year. "Why am I so incredibly and incurably romantic about Cornwall? One’s past, I suppose; I see children running in the garden … The sound of the sea at night … almost forty years of life, all built on that, permeated by that: so much I could never explain." Walking across Godrevy beach with the wind in my hair and waves breaking on the shore, it wasn’t hard to understand the magic of a place immortalised in literature. The lighthouse itself stands 86 feet (26 metres) tall on a rocky outcrop that marks the Stones reef, a hazard to shipping for centuries. It was the demise of the SS Nile that foundered in a storm on 30 November 1854, which led to its construction four years later. All forty crew and passengers had died – prompting St Ives master mariner Richard Short to write in the Shipping and Mercantile Gazette: "Had there been a light on Godrevy Island, which the inhabitants of this town have often applied for, it would no doubt have been the means of warning the ill-fated ship of the dangerous rocks she was approaching. Many applications have been made from time to time concerning the erection of a light to warn mariners against this dangerous reef, but it has never been attended to, and to that account may be attributed the destruction of hundreds of lives and a mass of property ... Scarcely a month passes by in the winter season without some vessel striking on these rocks, and hundreds of poor fellows have perished there in dark dreary nights without one being left to tell the tale." 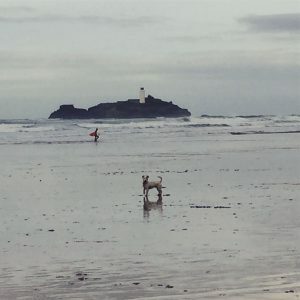 Godrevy beach is a good place to bodyboard or surf, exercise your dog or enjoy some exhilarating walking. 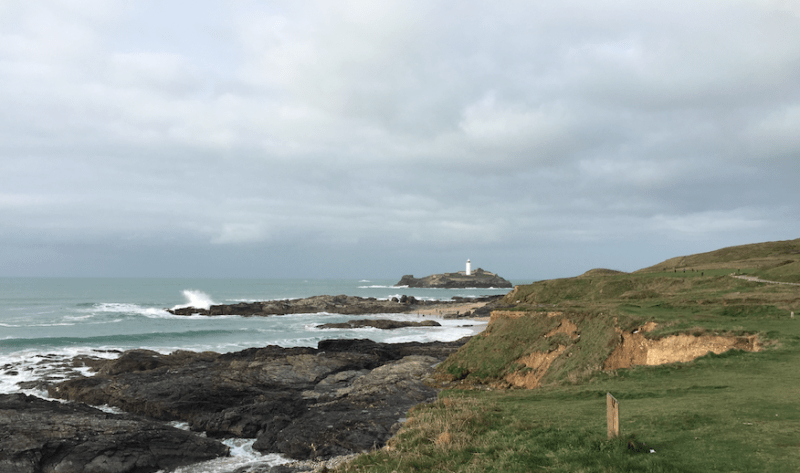 Now owned by the National Trust, there’s a headland route that takes you from the café car park, across the grassy clifftop affording stunning views of Godrevy Island, past the coastal heathland known as The Knavocks on, eventually, to a dramatic rocky inlet understandably called Hell’s Mouth. Home to gulls, oystercatchers and pipits, it’s an area of outstanding natural beauty that has changed little over the millennia. On a clear day you can see St Agnes Beacon to the north, Carn Brea monument to the east and St Ives to the west. It’s a place for drinking in the vista, filling your senses with awe and, mobile phone forgotten in your pocket, appreciating Nature in all its unspoilt magnificence. I know I’m waxing lyrical but Godrevy is another of those Cornish discoveries that has left a deep impression. Seen from afar, it’s a focal point. Get closer and it’s compelling. “You’d honestly never been to Godrevy?’ No. But now that I have, it’s engraved on my heart.